It's a relatively young brewery, only founded in 2002 in San Diego. The logo is fantastic and I've made it my task to find a glass from this brewery. As the name suggests this is an Imperial Indian Pale Ale, topped off by a great tag line down the bottom "All about the Hops! ", could there be a more perfect sounding beer? This Imperial IPA pours a cloudy honey colour with a magnificent white head. There appears to be almost no carbonation rising to this head, however with such a voluptuous head there has to be some. Excellent retention can be observed in this head and it laces the glass beautifully. It's hard to find flaws with the appearance of this exceptional looking IPA, hopefully it will taste as good as it looks! As this beer is poured, almost instantly you get a large grapefruit and pine smell; it's almost overwhelming. There are undertones of biscuity malt but it is extremely weak, as the resiny bitterness of the earthy hops and pine come through. This is going to be amazing it smells so strong and delicious, apparently there are 101 IBU's in this and you can definitely smell them! Green Flash have produced one of the tastiest IPA's I've ever had! It's absolutely amazing! It has a heap of pine flavour, it's literally like you are tasting a pine forest. There is grapefruit present to try and cut through what is an incredibly bitter, but enjoyable, beer. I believe there is malt present in this beer, however it's pretty hard to taste. The other flavours are overwhelmingly delicious! Is this my new favourite IPA? It's pretty damn close if it's not. 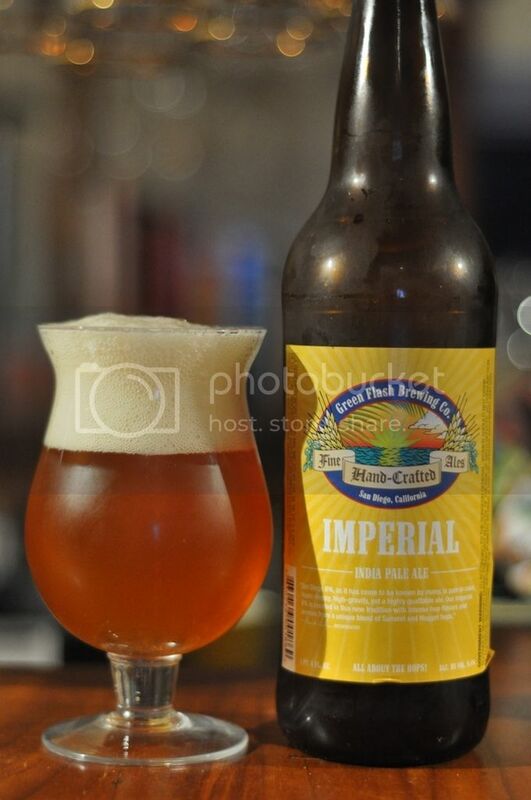 Green Flash Brewing have provided a beer with lots of piney hops that is simply delicious to taste. There is heaps of bitterness to this beer but it is surprisingly easy to drink. The 9.4% alcohol could become a bit of a problem as the drinkability is so good, but with a decent dinner first it should be okay. I can see myself drinking alot more of this in the future and I think all of you should try some as well! The entire Green Flash range is amazing (see photo of the Red IPA above), they are all worth a try! P.S. After reading that again I seemed to have not really described the flavour that well (it seems to just say piney and grapefruit...), however trust me it is delicious! BUY IT!